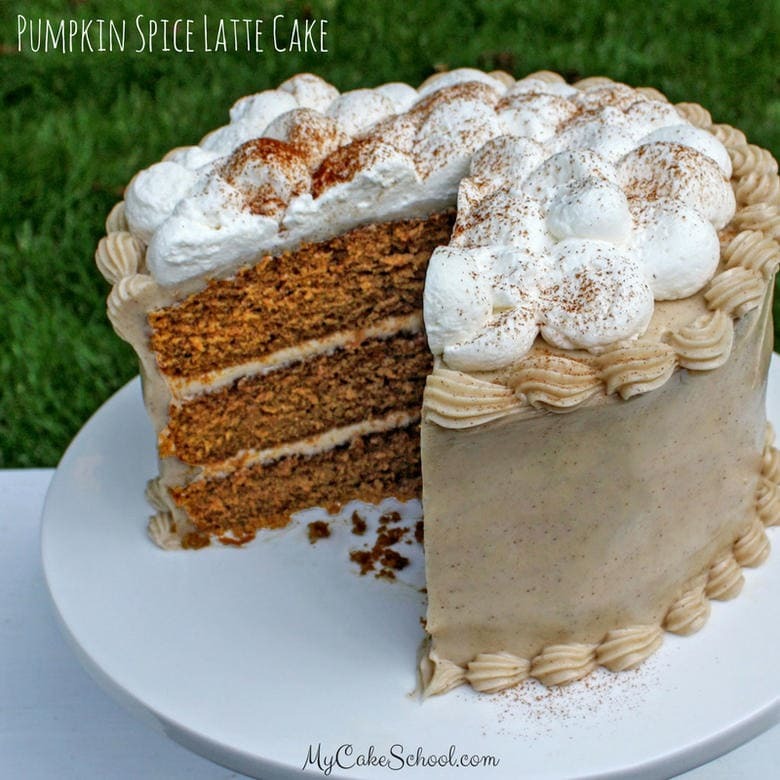 ‘Tis the season for Pumpkin Spice Lattes, and today I’m going to share the most AMAZING way to enjoy all of the warm and cozy flavors of your favorite drink in the form of a homemade, knock-your-socks-off, Pumpkin Spice Latte Cake! This flavorful Pumpkin Spice Cake is adapted from our popular scratch Pumpkin Cake recipe, with a few modifications. The result is a fantastic flavor combination of pumpkin, spices, and espresso. For an additional flavor boost, we brushed our pumpkin cake layers with an espresso simple syrup, and filled and frosted our cake with a creamy, heavenly cinnamon espresso cream cheese frosting. 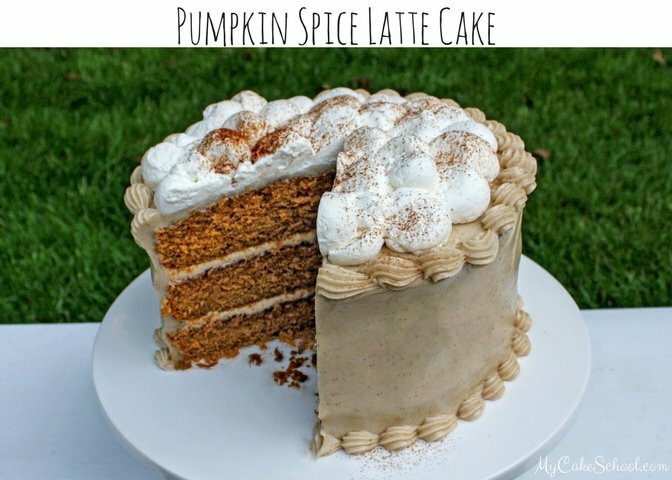 *The espresso in the Pumpkin Spice Latte Cake is noticeable without being overpowering. However, if you would like even more coffee or espresso flavor, try incorporating 1-2 teaspoons of coffee extract in the cake batter, and then additional extract to the frosting (to your liking). ** If you do not have cake flour, you can use all purpose flour (plain in the UK) and the following substitution: for each cup of flour in the recipe, remove 2 Tablespoons and replace with 2 Tablespoons cornstarch. For this recipe, measure our 3 cups of all purpose flour, remove 6 Tablespoons of the flour and replace with 6 Tablespoons cornstarch. Whisk to blend. In a medium size bowl, add the flour, pumpkin pie spice, baking powder, baking soda and salt. Whisk at least 30 seconds to blend. Set aside. In another bowl, add the milk, pumpkin, vegetable oil, vanilla and espresso dissolved in water. Set aside. In the bowl of your mixer, beat the softened butter until smooth. Add the white and brown sugar and mix on medium speed 5 minutes. Mix until just combined, do not mix above medium speed or over mix. Pour into prepared pans, smoothing tops with the back of a spoon. Bake at 350 degrees for 20 to 25 minutes or until a toothpick inserted in the center comes out clean or with just a few crumbs attached. Let cool 10 minutes, then turn out. In a small saucepan, add the sugar and water and bring to a boil. Once it begins to boil, remove from the heat and stir in the espresso/coffee granules. Allow to cool. You can refrigerate this until you are ready to use. Do not spread on the tops of the cakes until you are ready to decorate. Using a pastry brush, spread lightly on the top of the cake layers. Do not make them too wet. You will have some coffee syrup left over. Chill the mixing bowl and beaters or whisk attachment in the freezer for 10 minutes. Pour the whipping cream, powdered sugar and vanilla into the chilled mixing bowl, begin beating on low speed gradually increasing to medium high speed. The cream begins to thicken (approx. 1 1/2 minutes) and soft peaks form….peaks that slightly bend over. Watch closely as this happens quickly. Do not over beat or it will turn into butter. To assemble the cake, place the first cake layer onto the pedestal or cake base. Using a pastry brush, apply a light coating of the espresso syrup. Follow with a layer of Espresso Cream Cheese Frosting. Repeat this process for the other cake layers. Frost cake with Cinnamon Espresso Cream Cheese Frosting, and using a piping bag with a very large round tip (or with the tip of the piping bag snipped away), pipe cloud-like puffs of whipped cream over the top of the cake. Follow with a light dusting of cinnamon. * This is an extremely moist cake. If you need to cover this cake with fondant, I would recommend first ganaching it for an extra layer of insurance. 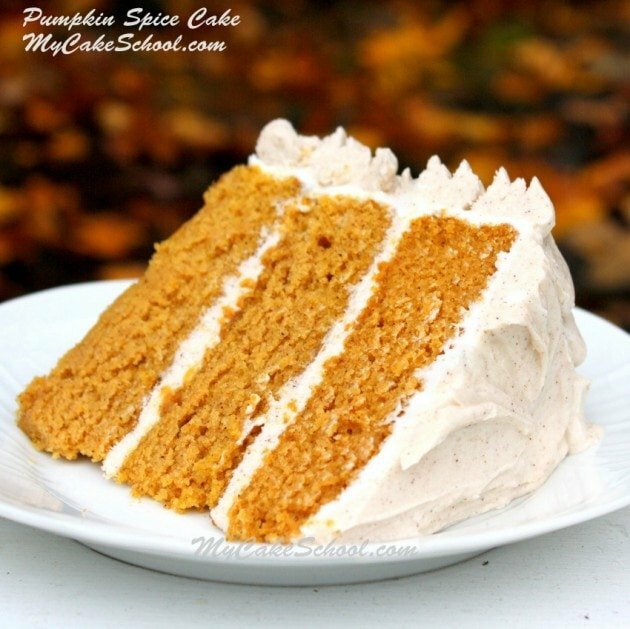 We hope that you enjoy this Pumpkin Spice Latte Cake recipe! If you love pumpkin, make sure to also check out our Scratch and Doctored Cake Mix versions of Pumpkin Spice Cake! For more fall favorites, be sure to hop over to our Fall & Thanksgiving Roundup of Ideas, Recipes, and Tutorials! You’ll find all sorts of deliciousness there, along with creative fall cake design ideas! Thanks for stopping by! Make sure to check out our Recipes Section for our full collection of favorite tried & true Cake and Frosting Recipes! You can also find our growing collection of Free Cake Tutorials in our Free Tutorials Section! Finally, if you are interested in having access to our full collection of cake decorating video tutorials, forums, and more, you can find Joining Information here. We’d love to have you! Looks & Sounds Delish! Adding this to my To Bake List :-) Thanks ladies! This looks amazing! I love coffee but never tasted pumpkin in a cake before. Have just printed recipe out as I have most of the ingredients and I can get canned pumpkin but pureed, hope that is okay. Hi Glossy, Yes, the canned pumpkin should be pureed. Hope you like the cake!! The cake looks gorgeous and delicious. Thanks for share!! Absolutely stunning! When I make cakes like this, they usually taste very good, but I never get them looking so good… congratulations! This is the best recipe ever written. I love how you included weights and substitutions. I always have to guess at some ingredient amounts because everyone has a different take on how to measure it. Even online info gives different weights for flour. So refreshing to follow a recipe that is this thorough. Cake is in the oven now and it smells delicious! Thank you so much for your feedback, Jacqueline! I’m so happy to hear it. We hope that you enjoy the cake! I thought it was absolutely delicious and I bake something almost everyday. The flavor was spot on and the crumb was perfect. I will be making this for my family’s Thanksgiving. Thank you! What are your suggestions on covering the finished cake while in the fridge and transporting? My cake stand lid is too short, and I don’t want to ruin my “foam” on top! Thanks! Hi Abigail, you can place the cake in a bakery cake box. The cake should be on a cake board that is slightly bigger than the cake, then the cake will not touch the sides of the box during transport. Close the cake box lid as close as it will go and not touch the top of the cake, tape it into that position. You can then add plastic wrap over the opening so the cake will be covered. Hope that is clear.